Welcome to this month’s “Thrifty Style Team” September edition. You better hang on to your cowboy boots for this one. There are 14 of us this month! You’re about to read the story about our cozy DIY “Whiskey Barrel Hoop Fall Wreath”, so pour yourself a whiskey and pull up a stool. Or just sip some hot tea on your sofa like me. My husband texted me out of the blue one day a few years back and said, “Dell has this amazing empty whiskey barrel he doesn’t want. Do you want it?” Dell is a friend of my husband’s just so you know. I said, “Heck yah. That sounds cool.” So, Rick brought it home in his truck and we put it in the garage and there it sat for 2 years, or maybe even 3. I lost track 😯 . Ohhhh…we discussed many ideas like a coffee table, a Christmas tree “stand”, and even a raised garden planter. It seemed like when the seasons changed, so did the ideas. This last month or so I realized it had become a “catch-all” in the garage and it just really had to go. I just never gained the energy to do any of the ideas and that’s okay. Sometimes (more times) we need to just let things go, you know? So, I sold it for a whopping $100 bucks. Before she escaped I grabbed one of her hoops. Don’t worry, she still had plenty of hoop-age. 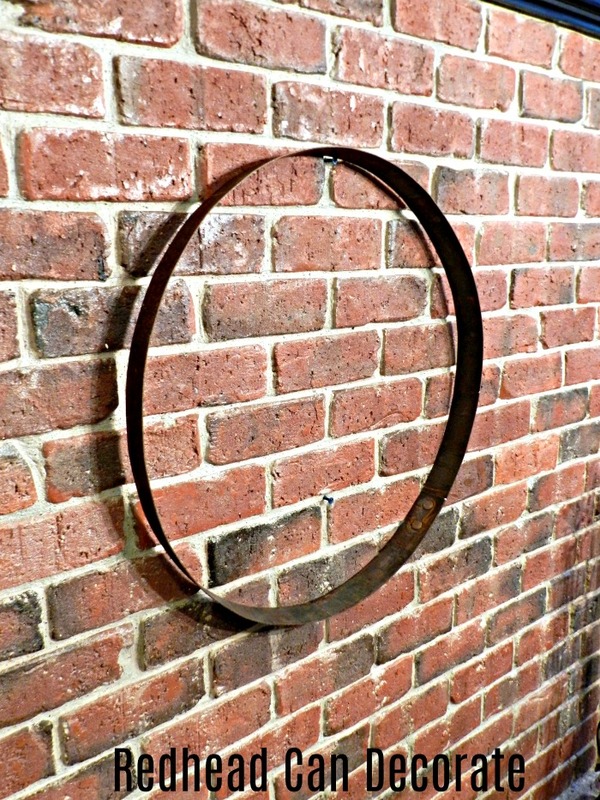 I’m not really a whiskey barrel hoop connoisseur, but I know a good rusty hoop when I see one. Just look at that baby. It almost gets by just like this. Oh, AND THEY SELL THESE ON LINE (see source list below). Well, I thought about leaving it like this, but I knew you might think I was slacking over here 😀 so I got my cowboy hat on and I started thinking as hard as I could. I have to admit that this repurpose idea did not come easy. I really had to search through some tumbleweeds. I knew I wanted a wreath, and I knew it had to be Fall. First, I tried attaching a bunch of dollar store faux Fall florals and it looked “okay”. It just didn’t make me smile though. It was boring as all heck to be honest. So, I dug deeper. I went into my ribbon stash and found the cute red and black flannel ribbon I used a couple years ago on my “Christmas Flannel Trees”. After I tied that to the top, it made me feel like I might be dressing it up for a Fall bonfire or something. I asked my kiddos if they thought the same thing and they agreed. I knew I was headed in a rustic direction. I went back downstairs into my “stuff” and found the sweater weather chalk board sign that I made last year (that was so easy to make you gotta see it here). I was planning on just putting it off to the side for my Fall tour coming up (October 5), but then I saw that it fit perfectly in the middle of the hoop. I asked Rick to drill holes in it and I attached it with a little twine (wooden matches attached with same glue that is in my source list below). Wait a minute. How about few mini logs like a campfire? Rick got up once again from his spot and helped me cut a few pieces of real wood log slices to glue on there. Then I just stuck dollar store Fall garland leaves in after it was dry. What do you think of it? I think it is cute as heck. Especially since I plan incorporating the entire cozy wood theme into my Fall porch tour which is coming up on October 5th. This “Whiskey Barrel Hoop Fall Wreath” is just the beginning of some really cute Fall ideas coming soon. 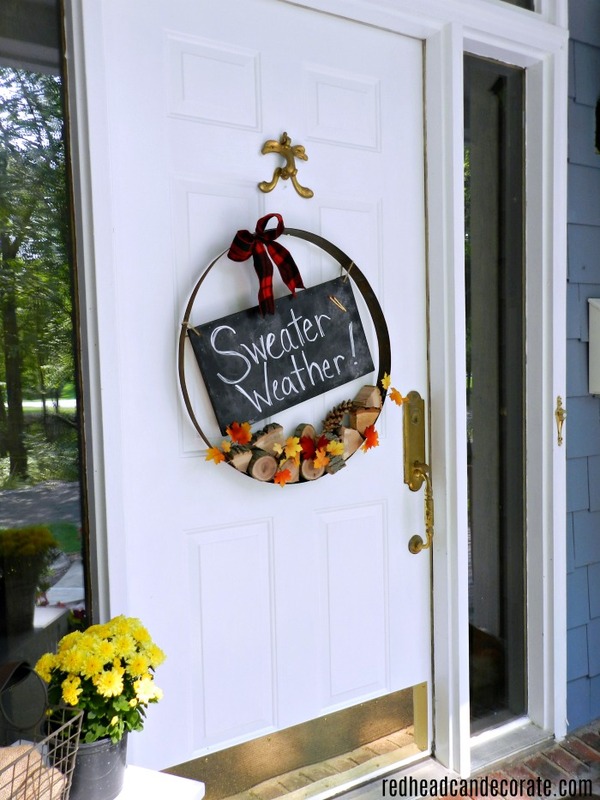 Absolutely Love your rustic Fall wreath. 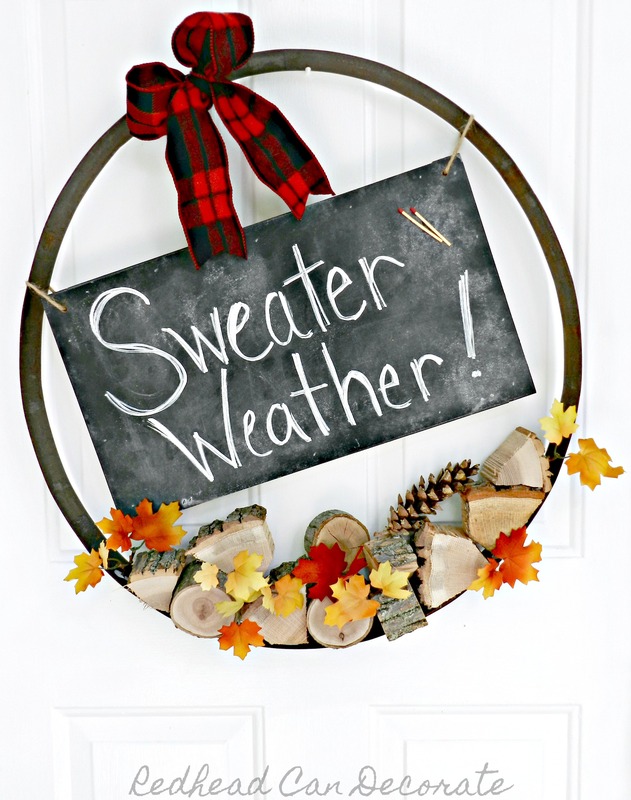 I do remember that sweater weather sign; perfect item and fit for your wreath. Great addition of the wood pieces. to start making a fall wreath. Thanks! This is such a clever wreath! I’m glad you finally got to do something with the whiskey barrel, lol! This is so fabulous Julie!!! What a genius idea and it looks so amazing! This is just the cutest thing ever, Julie! I love all of the little rustic touches. Have a wonderful fall, friend! I swear, I don’t know how you do it, but everything you do turns out absolutely gorgeous. I love this idea, wow! Love it! It makes me want to light a fire and enjoy the fall colors! Thank you, Kyle…stay tuned for the full porch. It has that Fall campfire theme. This is absolutely fabulous. I think God gave each one of us a gift. Not everyone know what their gift is, but for sure you found yours. Thanks again for sharing it with us. You always bring something mouthwatering to the table. Hi Ivory!! You always lift my spirits!!! You are a sweet friend. Defintely a gift!! Guess what I have falling apart in my backyard? 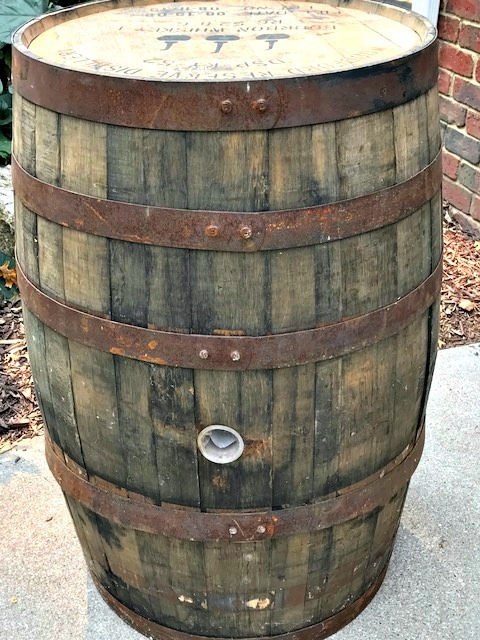 Yep I have an old barrel. I’m going to get out there tomorrow and see what I can do. Maybe I’ll have a new fall wreath coming to my home. No way!!! Let me know what you do Shirley!! You did it again. Super creative and unexpected. 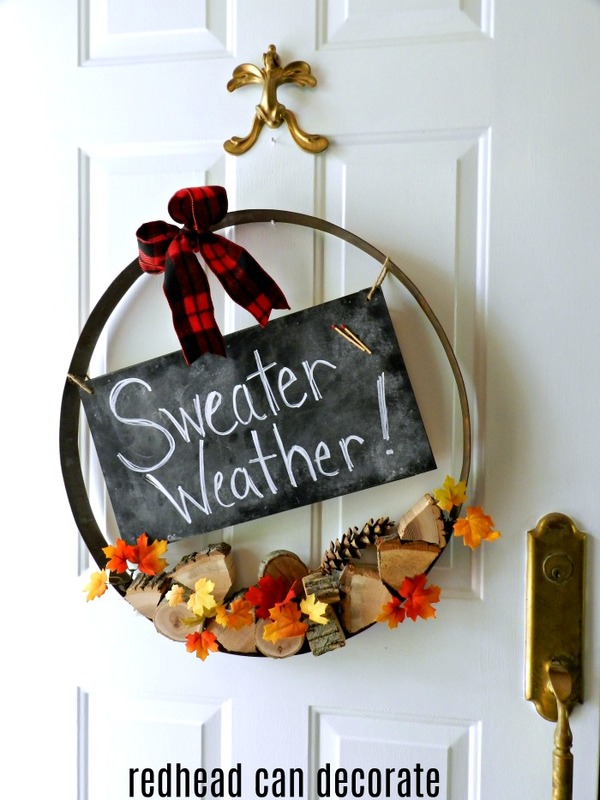 Love your twist on a fall wreath! I like that word unexpected, thank you, Jessica!! Happy wknd almost!! Loving the wood pieces and leaves at the bottom. Sort of looks like a campfire. Can’t wait to see your fall porch in a few weeks! This is so stinkin’ cute, Julie! I love the woodslices at the bottom…such a fun detail. I love it so I pinned it! You said that already lol! Oh, Julie. I am so glad I could finally open up this post. I tried all last week, with no success. BUT, I just LOVE your whiskey barrel hoop wreath. Everything from the ribbon to the chopped wood. 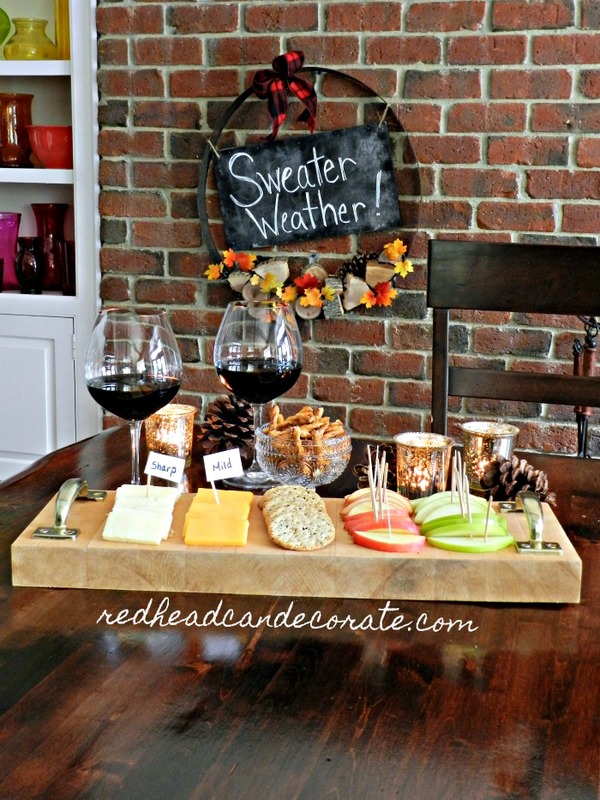 Really creative and perfect for Fall. Thanks for sharing and Happy Fall to you, my friend. Thank you, Meegan! Were you getting a page not found or was it just not opening?